With it being Christmas Eve, I didn’t bother putting a full post together, because there’s a good chance many of you are with your families and not reading my blog. If for some reason you did decide to visit my blog today, expecting a fresh new post detailing something awesome, I’m sorry to disappoint! This is just a quick post to remind you of a few things. First, don’t forget that the 25 Days of Chime are still going on. 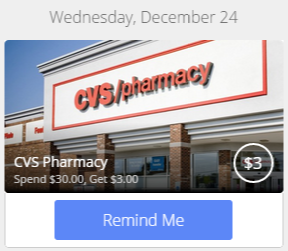 Today you can get $3 back after spending $30 at CVS and tomorrow you can get $3 in store credit to spend at Starbucks. 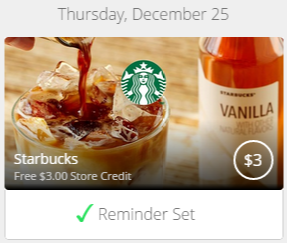 I’m not a coffee person, but if you are, that’s a sweet offer! Second, make sure you finished all of your end of year checklist. We only have about a week left of 2014. Finally, keep your eyes on Slickdeals and FatWallet, because there are going to be a lot of deals from now until 1/1/15. If I see some really good ones, I’ll likely be posting them here as well.